The fourth of our series of blog posts on cycling injuries with Bespoke's Head of Bike Fitting, Dan Pells, and resident Osteopath with New Body Osteopathy, Charlotte Mead focuses on neck pain, how you get it, how to fix it, and how to stop it coming back. Although many of us love it, humans weren't perfectly designed to ride bikes. We evolved to have our feet on the ground and balance our body weight through levers and pulleys designed for a mostly vertical system of movements. The position we create when we cycle changes the weight distribution through our muscles and spine, as well as bending the back and neck into a bit of an unnatural position to compensate so that we can see where we're going! For some people, this position can be quite extreme, it's no wonder neck muscles and joints sometimes get tired and irritated. What goes wrong when cycling? Road cycling involves extended periods where the neck is hyperextended (tilted backwards), particularly when the bike is set up with a large handlebar drop, e.g. when riding a time trial. This position can cause the deep neck extensors to become fatigued and stiff. When this occurs the trapezius muscle, which originates from the base of the skull to the shoulder, begins to support the weight of the head. Over time, cyclists can develop stiffness and pain in the upper trapezius and neck muscles. 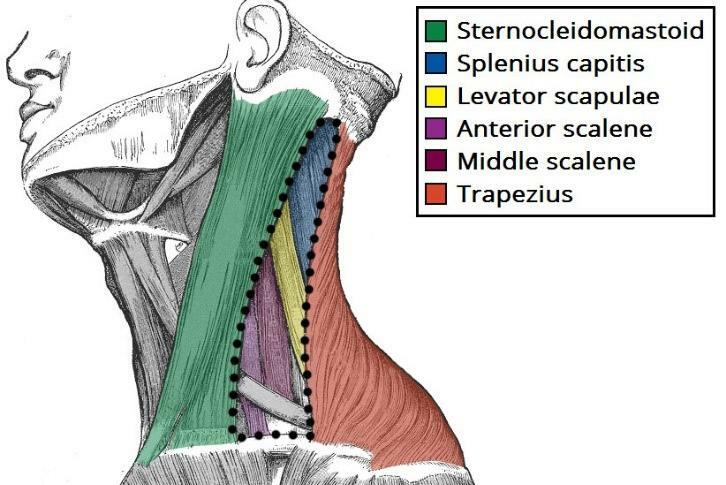 As well as muscular stiffness, one of the key areas of discomfort is the cervico-thoracic or C/T junction. The C/T junction is the knobbly bit at the base of the neck and the top of the thoracic spine. This is an area which takes a lot of load as it is the point where the extended curve of the neck changes into the flexed curve of the upper back - a change which is exaggerated in the position we need for cycling. This area can benefit from osteopathic treatment comprising of joint articulation and manipulation to encourage a greater range of movement in that area and help the body compensate. If this area is particularly immobile for you, it may be that stretches and massage alone only have limited effect. Handlebar height and length - Hyperextension of the neck is often caused by a handlebar position that is too low or too far away. 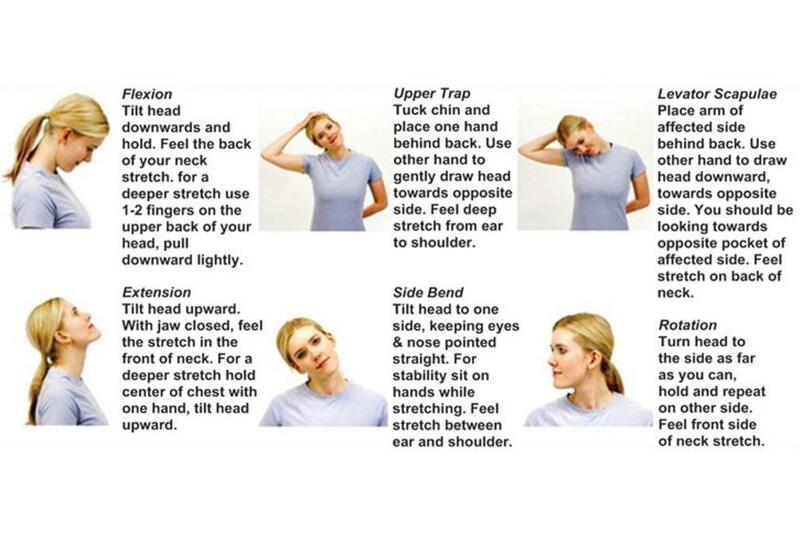 Neck pain can often be relieved by raising the handlebars, shortening the stem reach or a combination of both. This is particularly important for racing or triathlon bikes, where the neck is forced to extend in order to see clearly up the road. Making the handlebars more 'accessible' to the cyclist enables the neck to remain in a neutral position and avoids overload of the C/T Junction. Not only can this improve comfort, but also handling as the body weight is more central over the bottom bracket. Handlebar width - Another common cause of neck pain is handlebars that are too wide. This commonly causes pain in the C/T junction and in the upper back muscles, often felt as a burning sensation between the shoulder blades. When the handlebars are too wide, the neck and shoulder muscles take on additional load to support the anterior rotation of the torso. Narrowing the handlebars so that the joint centre of the shoulder is in-line with the wrist allows a more neutral spine and neck position. This will allow a cyclist to more easily flex the elbows, taking load off the upper back and encouraging the core muscles to engage. Exercises to warm up the muscles of the neck before heading out on your ride can help prevent neck pain, whereas stretches afterwards can help release tension that has built up during your ride (see below). You may find it beneficial to stretch under the heat of the shower post-ride, to maximise the effectiveness of the stretches, as well as soothe the muscles with heat therapy at the same time and promote blood flow to help clear away the waste products built up from exercise. An osteopath will be able to provide more specific advice on which areas you need to focus on and provide focused treatment on the joints, muscles and ligaments which may be contributing to your symptoms. For more information and to arrange a personal evaluation, visit New Body Osteopathy online and in our Gresham St and Canary Wharf stores. And of course we have more information on our bike fit services here and in-store too.